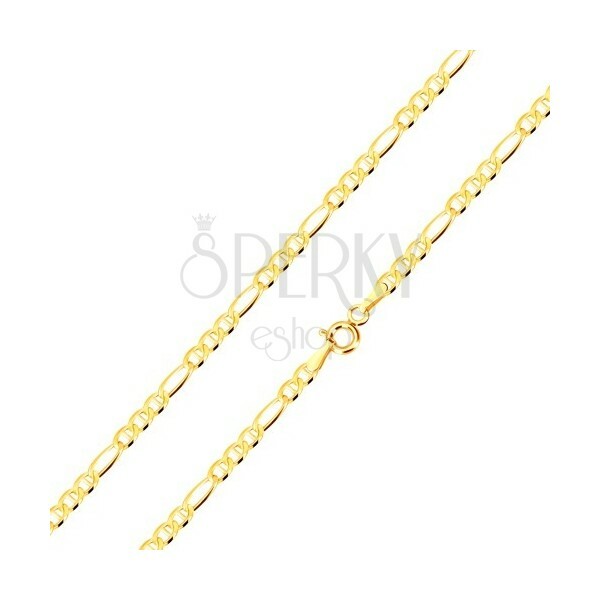 585 gold chain - oblong ring, three smaller oval rings with stick in the centre, lobster closure. By buying this product you can collect up to 109 points as a voucher of £18,53. Your reward points. Yellow 14K gold chain has motif of Figaro. The pattern consists of alternately longer oblong ring and of three oval rings seperated with stick. Rings are flat, slightly twisted and connected in series. Chain has smooth and glossy surface. Earrings have lobster closure.